We’d love your help. 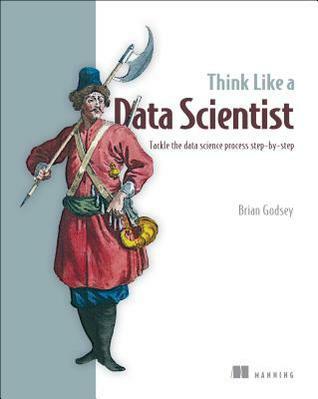 Let us know what’s wrong with this preview of Think Like a Data Scientist by Brian Godsey. Data collected from customers, scientific measurements, IoT sensors, and so on is valuable only if you understand it. Da Think Like a Data Scientist presents a step-by-step approach to data science, combining analytic, programming, and business perspectives into easy-to-digest techniques and thought processes for solving real world data-centric problems. Think Like a Data Scientist teaches you a step-by-step approach to solving real-world data-centric problems. By breaking down carefully crafted examples, you'll learn to combine analytic, programming, and business perspectives into a repeatable process for extracting real knowledge from data. As you read, you'll discover (or remember) valuable statistical techniques and explore powerful data science software. More importantly, you'll put this knowledge together using a structured process for data science. When you've finished, you'll have a strong foundation for a lifetime of data science learning and practice. Readers need beginner programming skills and knowledge of basic statistics. To ask other readers questions about Think Like a Data Scientist, please sign up. More seriously, this is a good introduction into the general *practices* of data science, one that does not try to teach you either statistics or programming, but spends much of its time in the vaguely defined but important areas of project design, tool choice, goal specification etc. A good complementary text to something like R for Data Science (or Data Science with R, which shows where MY preferences are). A great explanation of Data Science concepts. The author shows maturity in not suggesting that modern machine learning techniques may be an answer for everything and provides good explanations for when and why to use statistical analysis, machine learning and various techniques and patterns. I don't feel I necessarily learnt a lot while reading this book, but it definitely reinforced a lot of the knowledge I've gained from previous books and it gave me a slightly different perspective on how to A great explanation of Data Science concepts. The author shows maturity in not suggesting that modern machine learning techniques may be an answer for everything and provides good explanations for when and why to use statistical analysis, machine learning and various techniques and patterns. I don't feel I necessarily learnt a lot while reading this book, but it definitely reinforced a lot of the knowledge I've gained from previous books and it gave me a slightly different perspective on how to deal with potential data science problems. I would highly recommend this book for people with no data science experience that are looking to hire data scientists - this book will give you a broad overview and a good idea of what you want to look for in an employee/consultancy without going into too much technical detail. It was well written and exactly what I was looking for: knowing what a data scientist does ... although I have been doing R&D / Engineer work for a long time including project management and thus already know most planning things, it was interesting to read it from a data scientists point of view. It covers too many domains of knowledge and that's a con, but it contains some difficult concepts about statistics explained simply.